Can our hormones make us cheaters? Most discussions about cheating focus on ethics. But psychologist Robert Josephs, of the University of Texas at Austin, wondered: Are hormones involved? Because goodness knows hormones impact other decisions. If you know what I mean. So Josephs and team had volunteers take a math test. Each scored and reported on their own test. But Josephs sneakily baked in a reason to cheat. 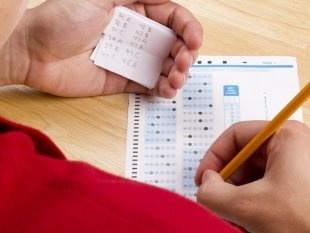 People could earn a few dollars for higher scores. Before the experiment and after, Josephs collected saliva samples to measure hormone levels. What happened? Some students indeed faked higher scores. Saliva samples showed most of these folks had higher starting testosterone and cortisol levels. Afterward, their cortisol level dropped. Why? Testosterone makes us fearless reward seekers, while cortisol is linked to being stressed. So, Josephs says, cortisol makes us stressed enough to cheat and testosterone gives the courage to do it. The proof, he says, is the lowered cortisol level afterward. That indicates stress relief. Hm. Instead of cheating, how about some yoga and a eucalyptus candle? Just a thought. Ommm. How Do You Spell Zika?